The best way to permanently replace a tooth is with a tooth implant. What is the best tooth replacement option? A dental implant permanently replaces a tooth and the end result is implant tooth that looks, feels and functions like a natural tooth. If done properly tooth implants are indistinguishable from natural teeth. We replace hundreds of teeth with teeth implants every year. We offer metal free zirconia dental implants as well as titanium tooth Implants. If you are looking for a local implant specialist in Burtonsville near Silver Spring and Columbia Maryland, we can help you. Prior to dental implants the best option to replace a tooth was to do a bridge. Bridge vs Dental Implant. 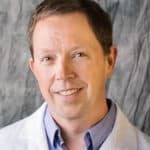 Dr. Gary Adams has been replacing teeth with dental implants as a speciality for over 15 years. He has done thousands of implants and is a consultant, speaker and instructor for Zeramex, the world leader in manufacturing ceramic implants. What is the Best Way to Replace One Tooth with an Implant? The best way to get a tooth replaced is to remove the bad tooth very carefully and put in the dental implant on the sameday. Same day dental implants is also called immediate implant surgery. It is very important to have a skilled implant surgeon remove the natural tooth very carefully so as not to damage existing bone and gum tissue. The tooth extraction site needs to be cleaned and the site evaluated by the implant expert. Often times there will be scar or cyst tissue from past infection that needs to be cleaned from the site. There may also be bone loss and the need for bone grafting. Most of the time the Implant dentist can place an appropriate sized tooth implant into the tooth extraction site along with a bone graft and PRF on the same day. This is called an Immediate Dental Implant Placement. The use of Platelet Rich Fibrin or PRF helps accelerate bone healing and new growth of bone around the implant. 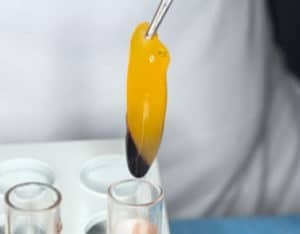 We also have new techniques using Platelet Rich Fibrin to help implants heal faster and stronger. PRF Platelet Rich Fibrin is a holistic implant procedure where platelets, fibrin, white blood cells are concentrated by spinning the patients blood and preparing for placement along with the dental implant at the time of dental implant surgery. Regardless of your tooth replacement option, PRF is good idea for implant surgery. It used to take up to 6 months for bone to grow adequately strong around dental implants. With new Dental Implants and PRF, healing times after implant surgery can sometimes take as little as 8 weeks. In cases where there is lots of bone infection and damage, healing can take up to 3-4 months. In very rare cases, bone graft surgery may need to be performed prior to implant surgery. In these later cases it can take 3 months for the bone graft to heal and another 3 months for the implant to heal for a total of 6 months to complete the tooth replacement process. Word to the wise, don’t let a tooth get infected too badly prior to replacing it. Not only does Bone Grafts take longer, but it can add a lot of extra expense to your dental implant case. Prior removing a tooth performing a tooth implant surgery, the dental implant doctor will take a 3D Xray to properly plan for tooth removal and immediate placement of your dental implant. 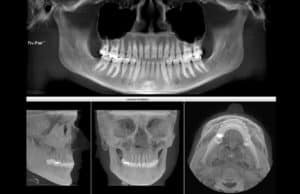 A 3D Xray aka Cone Beam CBCT scan is a necessary image for proper planning of teeth implant surgery. After reviewing the 3D X-ray, the implant expert will consult with you about any risks and potential complications that could happen during implant surgery. The 3D xray basically allows the implant consultant to place the implant without disrupting or damaging any nerves or arteries in your jaw. Implant Surgery should never be performed by anyone other than a qualified and trained implant professional. And tooth surgery should never done blindly without a 3D Cone Beam X-ray. How do I know if an Implant Dentist is qualified to do Dental Implants? There really is no exact way to know. Any dentist can profess to be an implant specialist, but the dental board does not recognize any dentists as implant specialists. Most Dental Schools do not do any formal implant surgery training. Training for dental implant surgery training is usually received in a post doctoral program at an academic institution or by various Implant Training Institutions. One such program is the Misch Implant Institute. But here are a few tips so you can tell. Also, just because someone has a degree of certificate does not mean he/she has incorporated implant training into their practice. The real question is does the dentist have experience, know what they are doing and get good results. If the implant dentist is serious about implant surgery they will have an on-site 3D-Xray system. The systems cost around $150,000 – $200,000 compared to a $10,000k 2D system most dental offices have. That is a big investment and a serious implant dentist would most certainly have a 3D system. Ask the dentist to see how many implants they have in stock. We have over 200 implants in stock on the shelf in our supply. All sizes, shapes and ones made of titanium and other made of zirconia. The inventory is very expensive, but if a dentist does a lot of them, they should have them in stock and ready to do. Ask the implant dentist how many implants they have done. Ask if they replace just single teeth or if they do full mouth implant cases such as All on 4 implant bridges. The dentist should be able to show you models and explain how they do the different cases. Look for implant reviews online. Many patients will review specific procedures they have done. Look on their website to see if they have any information about implants. consider where the dentist practices and how long he/she has been in practice. if a implant doctor practices in a busy professional area such as Burtonsville Silver Spring and has been in practice for a while, the odds are he/she must do good work. People in a professional area complain a lot if they get a bad service and you will probably see the complaints online. What Dentist is Best to Consult for Tooth Replacement Options? Many dentist such as oral surgeons and Periodontists will claim they are implant specialists when they are not. In fact, most oral surgeons and periodontists will graduate having done fewer than 10-20 implants. We place hundreds of implants every year and we are happy to meet and discuss your tooth replacement options.